I would like invite you to my webiste www.platener.eu where I present example of my armour reproduction. More information are on my website. some great looking stuff! Welcome! Before I came here I was confused about this subject. Having listened to your lecture I am still confused... but on a higher level. More and more Polish makers appear on myArmoury! You have some nice stuff Piotr! it that is the only truth. I have made some update on my website. I add some new version of hourglasses - made of mild steel - and also a two covered cuirass - first on leather and second with linien. There are also some new leg harnees. Another update on my website. I add photos of heat hardened arm harness, made of mild steel, final harndess is 40 HRC = 395 VHP. There are also few photos during the forging some elements. I encourage you to place new order for armour elements I offer high quality product, attachment to detail, competitive prices and much more. This time I want to present my recostrucion of a klappvisor bascinet from Sitten in Switzerland, 1360 c.
The more I see of your work, the more I like it! P.S. The 13th Century is awesome. 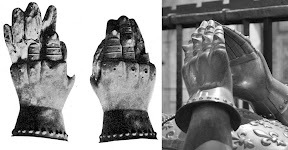 Today I want to present you one of my recent work - hourglasses gauntlets based on effigy and funeral gauntlets of Edward The Black Prince. Raised on hot from medium carboon steel without welding. Some nicely done stuff and it looks like you're staying fairly busy. Good all around. Got some stuff from Peter like one of gauntlets presented above and breastplate. May trully recommend him as very good craftsman. All stuff useful for both - reconstruction only or reconstruction and combat fighting. Thank you Joe and Bartosz! Soon I will present new leg harness with hardened cuisses. I add photos o new leg harness, made of medium carboon steel. The cuisses are based on Churburg leg harness, full greaves are inspired by greaves from Metropolitan Museum of Art. Ciusses are fully hardened to about 38-42 HRC. More photos on my website. I wish you all Merry Christmas and Happy New Year!